On Wednesday, community members gathered at the Village Ballroom to help build the future of the Community Cycling Center through an evening of idea sharing, priority building, and discussing the challenges facing our community at our first annual Jeffersonian Dinner. 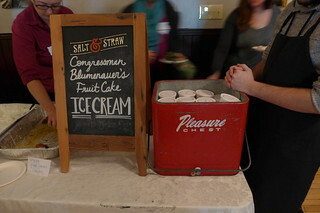 Discussions ranged from what strategic direction the Cycling Center should take in 2015 to which initiatives in 2014 were the most relevant to our community, all while enjoying a dinner of Lebanese food donated by Nicholas Restaurant followed by Earl Blumenauer’s Fruitcake Ice Cream, compliments of Salt & Straw. Through live polling the participants, it soon became apparent which 2014 events were the most important to our community: Getting bikes to kids in East Portland (30%), developing community leadership capacity (25%), and removing barriers to bicycling in our partner communities (18%). Of course, interest didn’t stop there. Throughout the room spirited conversations on community-based bike events, community project engagement, and the Holiday Bike Drive filled the air. Animated faces, gestures filling in the details of a story, and attentive listening were the hallmarks of the event as community members shared their stories and experiences with each other. 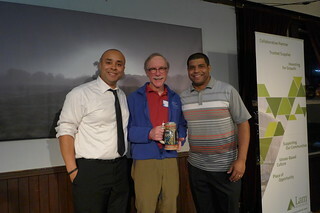 Adding to the evening’s atmosphere of fun was a spontaneous donation of an Oregon Public House Founding Member stein (all Founding Members get a free beer a day for life) for a live auction at the event. With the final bid at $1,100 (and 100% of the proceeds going to the Community Cycling Center), thrilled doesn’t even begin to cover how happy we are. The Balance Bikes, which were on display, also received some well deserved attention with new bids coming in with a week left in the silent auction (Remember, bids will be accepted through December 17th — so you can still win!). 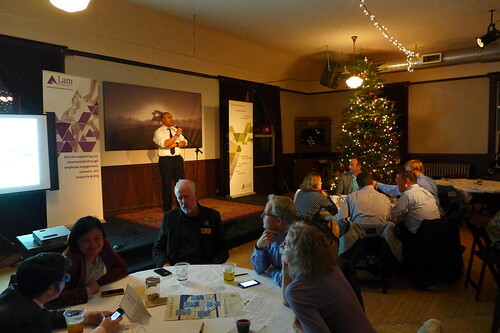 All in all, last night’s Jeffersonian Dinner was a huge success, giving the Community Cycling Center (and our community) some solid and achievable goals to reach for as we build our strategic plan for the next five years. You can view the live-polling results here for the final question of the evening – “what would you love to see the Community Cycling Center doing in 2016 and beyond?” Last night’s impact didn’t end with the Community Cycling Center, participants gained some great networking opportunities and conversation partners — many people opted to stay after the event ended and continue their discussions into the night. And that, we believe, is success. Special thanks to our winter campaign sponsor, Lam Research Foundation, and our Jeffersonian Dinner sponsors, Lancaster Engineering, Cyclone Bicycle Supply, DK Whitaker Engineering, and Kristin Lensen Consulting for making this wonderful evening possible. For more photos, please see our Flickr album.